Since taking up my post as United States Ambassador to the Holy See on December 22, 2017, I’ve often been asked to explain the benefits of maintaining an embassy to the Vatican. After all, the territory of the Holy See, the government of the Roman Catholic Church, occupies less than one quarter of a square mile. So why do we need an embassy? Following their meeting, President Reagan returned to the United States and instructed the State Department to work closely with the Vatican. “I want a full-fledged embassy,” he ordered. Two years later, in 1984, the United States Embassy to the Holy See was established. The embassy’s mandate was to work hand-in-hand with the Holy See to counter the destructive and destabilizing behavior of the Soviet Union. We succeeded through the leadership of President Reagan and Pope John Paul II, and the resilience of the American people. Today we are faced with different challenges — equally great and perilous. That synergy endures to this day. The necessity of our partnership did not end with the fall of the Berlin Wall. It remains critical to U.S. national security priorities, from responding to humanitarian crises and safeguarding human rights to countering the aggressive behavior of states and preventing and mediating conflict. And the reason is simple: The Vatican is a soft-power superpower. Its impact, under the leadership of Pope Francis, is real and respected around the world. The Church is engaged on every continent, advancing human rights and religious freedom, mediating conflict and preventing violence, inhibiting the spread of epidemics like HIV/AIDS and Ebola, and fighting terrorism. The Holy See also has the second largest diplomatic presence behind the United States – with 183 diplomatic partners. The Vatican, through an unrivaled network of local contacts, plays an active role in countries where many governments have difficulty operating, from the Central African Republic and South Sudan to Syria. Across much of Africa, the Catholic Church serves on the frontlines as the only viable institution in society. In the Democratic Republic of the Congo, the Catholic Church continues to play a critical role in supporting political dialogue and providing humanitarian relief. In the Central African Republic, the Holy See has been and remains a crucial mediating force, bringing opposing parties together and achieving results. Pope Francis’ visit in 2015, for example, brought Muslims and Christians together, helping to pave the way for a peaceful and democratic presidential election. The Vatican’s unique ability to develop trust, work with local communities, and deliver messages is unlike any nation-state. And the Catholic Church is one of the world’s largest providers of education, healthcare, and humanitarian assistance. Its extensive network of relief workers and service providers has access and credibility in the world’s most troubled areas. America benefits from this enormous reach and soft-power influence. In short, the United States Embassy to the Holy See serves as a global engagement post. We leverage the global impact and network of the Vatican – extending to more than 1.3 billion Catholics and millions of non-Catholics as well – to promote our common priorities in every region of the world. The Vatican is also an important U.S. partner in fighting modern slavery, promoting democracy, and safeguarding human rights, particularly related to religious freedom. For example, the United States and the Holy See share a commitment to combating the global evil of human trafficking. President Trump has pledged to bring the “full force and weight” of the U.S. government to this fight. Our two governments are likewise committed to protecting and promoting religious freedom in every part of the world. As indicated in the 2016 International Freedom Report, when this fundamental right is denied, “instability, human rights abuses, and violent extremism have a greater opportunity to take root.” Our embassy works closely with the Holy See to secure the future of not just Christian minorities but all religious minorities who are persecuted simply for professing their faith. The Holy See’s vast global influence makes it a critical partner to address a wide range of issues. 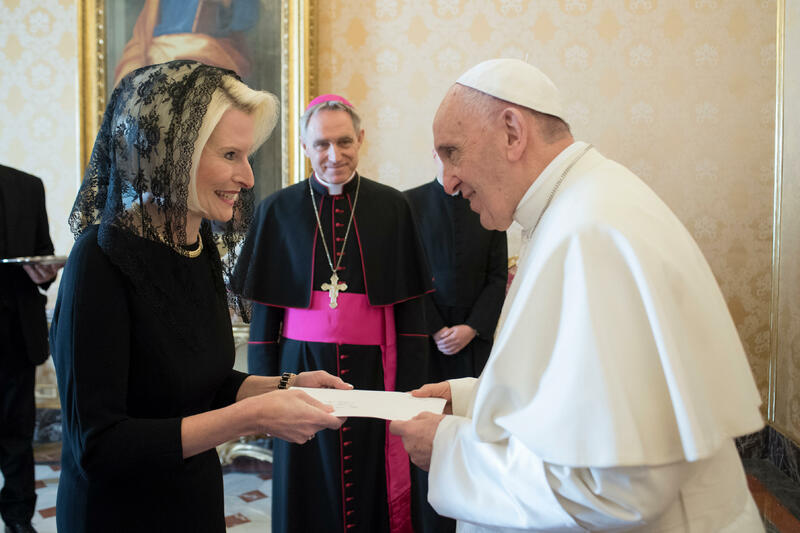 Working together with the Vatican, the United States Embassy to the Holy See will continue to promote peace, freedom, and human dignity throughout the world. Editor’s Note: This entry also appears in the U.S. Department of State’s publication on Medium.